State-of-the-art railway interlocking systems typically adhere to the product line paradigm, where each individual system is obtained by instantiating a generic system with configuration data. In this paper, we present a domain-specific language, IDL, for specifying generic behavioural models and generic properties of interlocking systems. An IDL specification of a generic model consists of generic variable declarations and generic transition rules, and generic properties are generic state invariants. Generic models and generic properties can be instantiated with configuration data. This results in concrete models and concrete properties that can be used as input for a model checker to formally verify that the system model satisfies desired state invariants. The language and a configuration data instantiator based on the semantics have been implemented as components of the RobustRailS tool set for formal specification and verification of interlocking systems. They have successfully been applied to (1) define a generic model and generic safety properties for the new Danish interlocking systems and to (2) instantiate these generic artefacts for real-world stations and lines in Denmark. A novelty of this work is to provide a domain-specific language for generic models and an instantiator tool taking not only configuration data but also a generic model as input instead of using a hard-coded generator for instantiating only one fixed generic model and its properties with configuration data. L.H. Vu and A.E. Haxthausen research has been funded by the RobustRailS project granted by Innovation Fund Denmark. 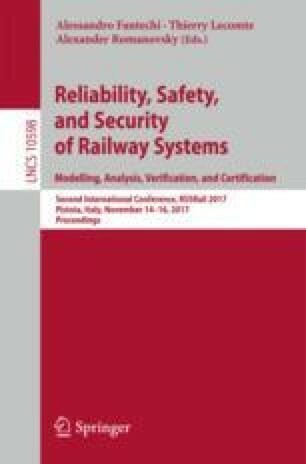 The authors would like to thank Ross Edwin Gammon and Nikhil Mohan Pande from Banedanmark (Railnet Denmark) and Jan Bertelsen from Thales for helping us with their expertise about Danish interlocking systems; and Dr.-Ing. Uwe Schulze and Florian Lapschies from University of Bremen for their help with the implementation in the RT-Tester tool-chain.